A couple of years ago I went to a con and one of my favorite authors was there. She writes a very good urban fantasy series that it’s quite popular. She also has an okay following on social media, so I had been reading her tweets and following her journey as an author. I was so excited to meet her. I figured she was geeky and loved similar books so she would be awesome in person too, right? I went to one of her panels and there were several authors there, each good writers in their own right. It was a great panel, with a good discussion. I listened intently and followed a couple of the other authors, even added a book or two to my wish list. Then came the Q&A and I asked one question that I hoped someone would have a good answer for : if you want to do cons, get tables, or be on panels, how do you cope with anxiety? I’ve had anxiety issues for a while. Crowds terrify me, and it’s even worse if I am the center of attention, like being a panelist at the front of a room would be, so it was a valid question. And if course the person saying it was the author that I really liked. The room got a little quiet for a brief moment, then another author on the panel said he actually had the same issue and gave me tips on how to deal with my anxiety at a con. They were great tips and I used them the next year…. When I was on five panels! Screw people that tell you that you can’t do things because of your short comings. If a man can climb mount Everest with no feet, or a man completely paralyzed can write a book with just eye blinks, then you can do whatever it is you want to do. Really, you might meet your celebrities one day, the men or women that made it before you, but they are not infallible. They might do something or say something rude. They might burp, or hide away from the public. None of that really matters. What matters is making your life your own. Following your dreams. Working hard and not letting stuff get in your way. 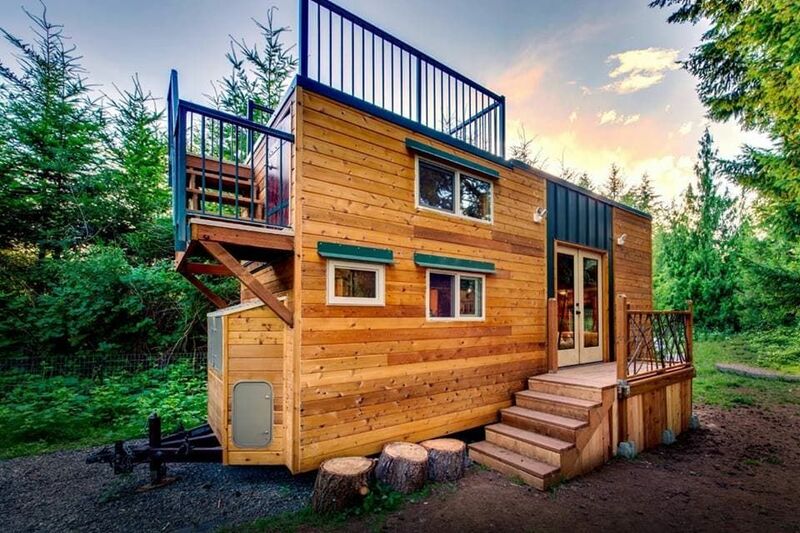 ​The first time I thought about living in a tiny home I was 14 years old. I was probably hiding in the shed out back from my sisters, and I looked around at the huge space and thought….I could live in here. Then I wouldn’t have to share a room with my sisters. Over the years I never quite lost the idea of having my own place, my own room, and my own building that I owned and no one could tell me no to. But, alas, I have always rented. Always had to stick with the ugly beige carpets that stained within a week of cleaning. Always had to deal with stark white walls, and be okay with the white kitchen that got gross and stained more and more each year. But it was cheaper to rent than buy, right? Well, yes and no. I was always okay with buying a place, paying morgage, ripping out carpets and putting in the work to clean it myself. I wasn’t able to, though. Houses are expensive, especially in our area. So I’ve often dreamed of taking a shed out to a piece of land somewhere, and just making it into my home. And there are really large sheds now that you could comfortably live in. But we live in Washington, and tiny houses aren’t exactly legal here. They say it’s because of fire hazards, but we know it’s mostly because of real estate interests. But what can you do? So now that Tiny houses are more common, and people are actually making them work all over the place, I’ve been looking into it again. I’d like to build one, but I want it to be comfortable for me, and Gregg. And that’s the trial here. We have very different ideas of what will work.